In April 2018, the Biddle Consulting Group Institute for Workforce Development (BCGi) hosted the third annual BCGi Summit – a conference that brings HR professionals together to hear real world experiences from the experts and to network with one another. This year’s Summit focused on the fundamentals of Equal Employment Opportunity, Affirmative Action, and diversity, providing our attendees with information that is timeless (and Administration-proof). The Summit was hosted in partnership with Charles Schwab. To thank Charles Schwab for their generosity, all profits from the Summit have been donated, in the name of the Charles Schwab Foundation, to the Boys and Girls Clubs of San Francisco. The Charles Schwab Foundation is a private, nonprofit organization funded by The Charles Schwab Corporation. Its mission is to create positive change through financial education, philanthropy, and volunteerism. The Charles Schwab Foundation has presented more than $550,000 in college scholarship grants to Boys & Girls Club teens. If you attended this year’s BCGi Summit, thank you for helping make this donation possible! Learning Pivot Tables Can Change Your Life! Our webinar instructors at BCGi work hard to present relevant and practical information and it’s gratifying when we receive feedback from our webinar attendees. Recently BCGi Platinum member Natalie Pickens sent us an email about Patrick Nooren and Fue Lo’s pivot table webinar. Not only did Natalie watch the live presentation, but as a BCGi Platinum member, she watched the recording, too! 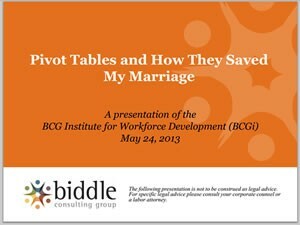 I wanted to take the time to thank you again for facilitating the webinar focused on pivot tables. After reviewing the webinar a couple of times, I worked up enough courage to generate raw data required for the EEO-1 report, from our HR System, and used pivot tables to confirm the accuracy of the data reflected in a pre-generated EEO-1 report. Not only did I discover inconsistencies, but I also discovered just how powerful pivot tables are and I love them! I’m no pro, but thanks to you both – I’m working hard at becoming one. Again, thank you both for all of your efforts and all you do to contribute to the HR community. Thanks for the feedback, Natalie!